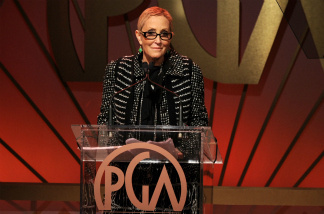 Producer Laura Ziskin, winner of the Producer's Guild of America's 2011 Visionary Award, spoke onstage during the 22nd Annual Producers Guild Awards at The Beverly Hilton hotel on January 22, 2011. Laura Ziskin, one of Hollywood's top producers, died last night after a long battle with breast cancer. She was 61. She produced the Spider Man trilogy, Fight Club, Pretty Woman, and As Good As It Gets, among many others. Sharon Waxman of TheWrap.com and author of the book Rebels in the Backlot, which features interviews with Ziskin, is on to talk more about Ziskin's life.